Finally, reading week is here. The past week was rough on all of us, but we've survived, and now we get nine full days to recover and catch up on work. I figure that since I've got this nice spot to throw my work onto, I might as well go ahead and do so. I don't have a lot to put up since I'm not big on doing "finished" work, but I have a character turnaround and a painting for your perusal. 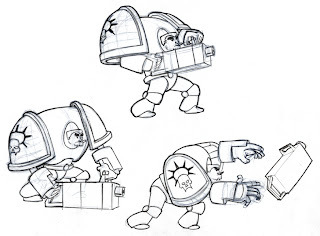 Here's the turnaround I did for Pete Emslie's character design class, then used later for the "Weight Lift Toss" animation in Mark Mayerson's animation class. We also had to do poses of the character grabbing, lifting, and tossing an object. The drawings could be viewed as keys for the animation, though I ended up doing completely new poses for mine. The first painting assignment Mike Hitchcox gave us this year was to paint an outdoor layout, either one of the examples he gave us or one of our own. I opted for one of the provided layouts since I have none of my own to work from. 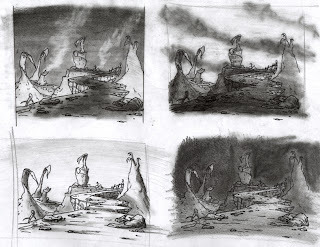 The first step we had to do was a set of rough tonal thumbnails. 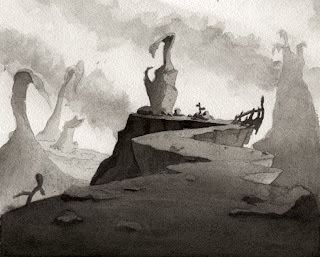 These were done on plain printer paper with graphite powder and a Tombow 2B pencil. 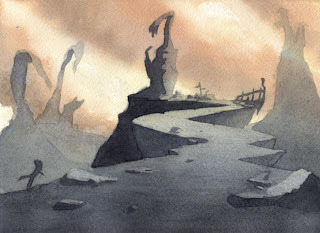 We chose the rough that worked best, then did a final tonal painting of it. This one is on Arches 140lb Cold Press paper using Winsor Newton Ivory Black Gouache. We then took the tonal idea and used it to formulate some color roughs (which I have misplaced), and then produced a final color key painting. This is also on Arches 140lb Cold Press with Winsor Newton Gouache. In other news, I'm working on figuring out Adobe's new version of Contribute, and for whatever reason, I can't upload photos to Blogger directly thru the program, so I'm working on figuring out a solution. In the meantime, the pics may be nonexistant, or show scaling artifacts. Hopefully I'll get that cleared up soon enough.